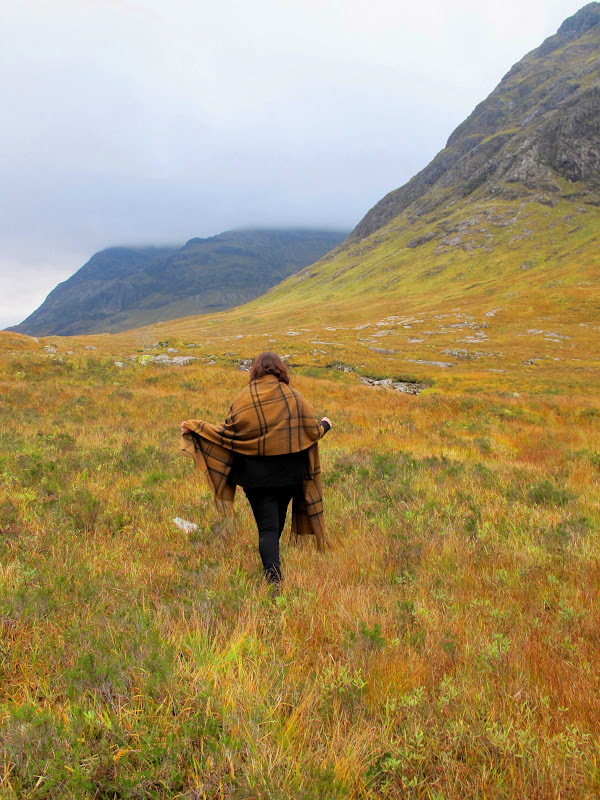 HARRIS TWEED PART 1 - ANIMALS AND LANDSCAPE — CLAFLIN, THAYER & CO.Claflin, Thayer & Co.
Scotland was really an epic trip for fabric research and buying. I'm going to split my photos into several parts - this one, another one specifically about the fabric itself, and then further down the road another about some of the things I've made with the tweeds I brought back. 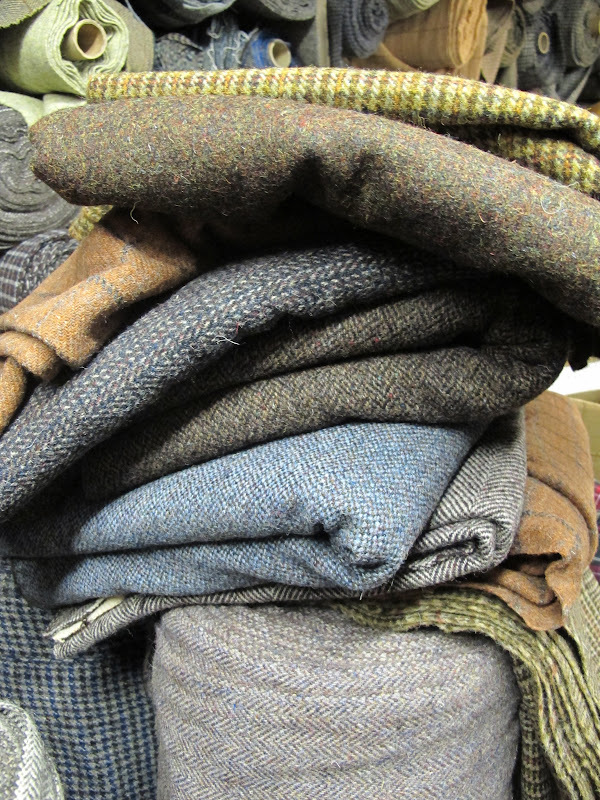 Harris Tweed is really special in terms of production and quality. All of the wool used in the manufacturing of Harris Tweed must come from Scotland (primarily the Western Isles). Once the the sheep are shorn, the raw wool is brought to the Isle of Lewis and Harris, where it is spun into wool yarns. The finished yarns are distributed to individual weavers who bring them to their homes and weave them into the beautiful fabrics that make up Harris Tweed. This is a true example of cottage industry - there are only a hundred or so weavers, all of whom work in their homes on old-fashioned petal-powered weaving machines the same way they did 100 years ago. Once the fabric is finished, the weaver brings the yardage to be inspected by the Harris Tweed Authority, who will give the tweed the official stamp of approval once it's been inspected. Only fabrics woven in the Outer Hebrides isles of Scotland can be categorized as Harris Tweed. You can read more about Harris Tweed HERE if you're interested, or watch the BBC miniseries TWEED which I linked to in a previous post. 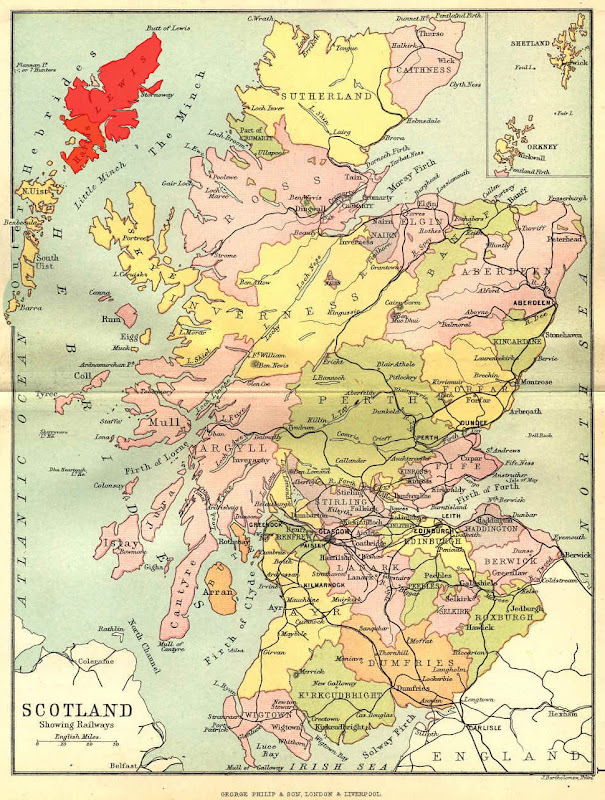 I've highlighted the Isle of Lewis and Harris on the below map in red. After a several hours long car drive north from Glasgow to the Isle of Skye and another few hours on a car ferry, we arrived on the island where we were able to see the landscape, animals, weaving sheds, and the tweed itself. I can't tell you how inspiring it was to watch the tweed making process from start to finish. These photos are actually from Glen Coe on the mainland, but they give a great sense of the colors of the landscape that make up the tweeds. Tweeds are primarily made of vegetable-dyed yarns in tones of orange, red, green, and purple, which get their colors from the lichen, moss and grasses found throughout Scotland. Just looking at the hills, can't you imagine them turned into a Ralph Lauren tweed? Here is a castle, just for good measure since they are all over Scotland! Castle Eilean Donan on the way to Isle of Skye. 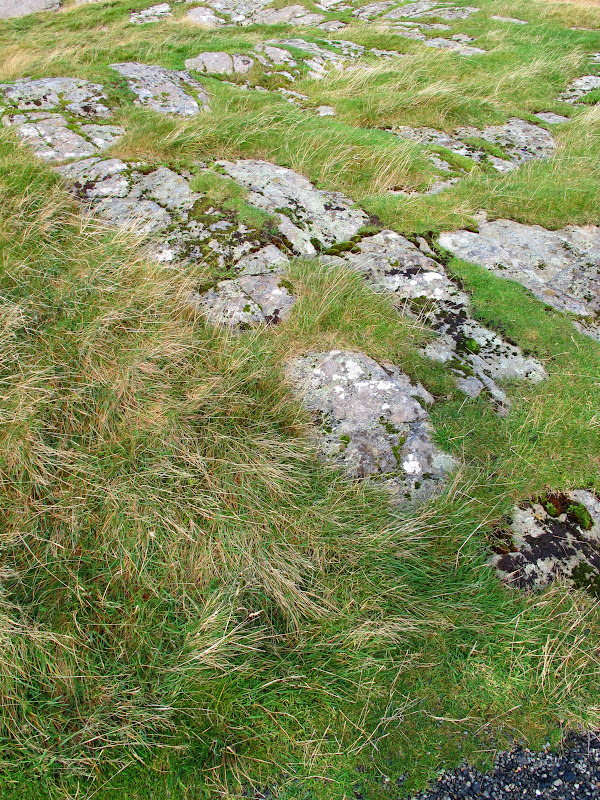 Moss and grass all over the place. This is where the dye comes from! Beautiful, happy, healthy animals everywhere. Curly horned rams. Don't mess with them! And here are the sheep! Their wool makes up the tweed after being shorn, processed, dyed, and woven. Since sheep are roaming everywhere, each one is marked with different colors of paint to distinguish one pack from the next when they get mixed up. Here I am in the pen with some shorn wool. The raw wool is taken to one of several facilities on the island where it's cleaned, dyed, and spun into yarns. 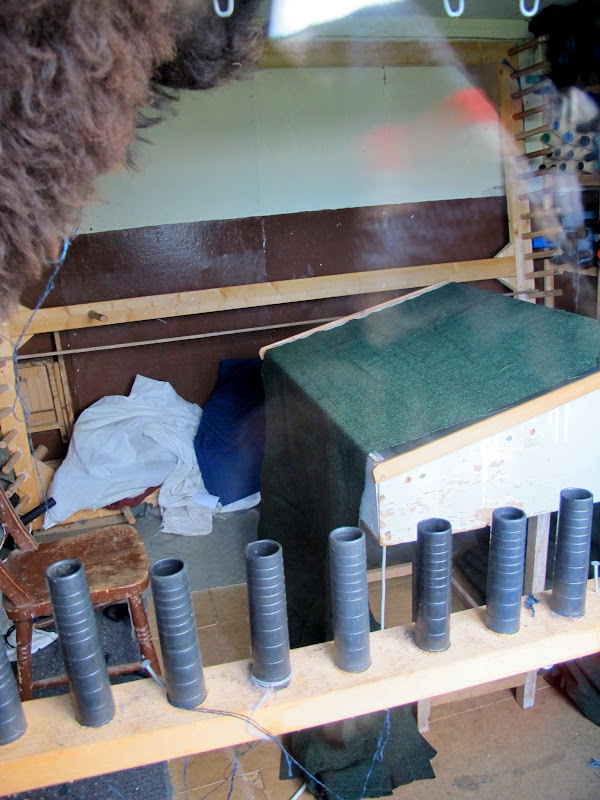 In the below photo, you can see the bag of unspun dyed wool on the floor and the finished spun yarns on the machines. The finished yarns are then delivered to a weaver, who generally has a shed or workspace at their home. Here we are peering into the window of a weaving shed - we were here on a Sunday and everyone was at church. The sabbath is taken very seriously on Lewis - no work on Sundays! That means no weaving. Here is a loom where tweed is being woven with the yarns. I love to see peoples work spaces - the little boom box, tools on the wall, all the same things I have in my studio except a giant loom. Yardage of finished tweed and empty yarn spools. And here is Harris Tweed! t was such an amazing experience to visit this place, I already want to go back. Next part I'll show all of the different fabric I looked at. Stay tuned.